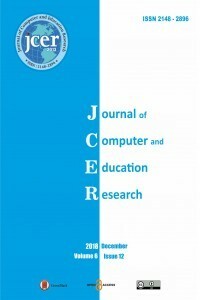 Journal of Computer and Education Research is an international academic refereed journal accepting educational articles in all social and science fields. It started to be published in 2013 and is featured two times in a year in April and December. Our journal is indexed in“TR Dizin, Index Copernicus, Directory of Open Access Journals (DOAJ), DRJI, Cite Factor, OAJI, NewJour, Research Bible, Academia Social Sciences Index (ASOS), Turkish Education Index, Academic Index, SCIPIO, Academic Keys and Scientific Indexing Service”. By publishing original research papers, it aims to be a qualified source of data for researchers who study on computer and educational sciences and people who use this data. To gather all the experiences in the education field of the computer and education world, JCER accepts quantitative and qualitative studies in all the fields of educational sciences and of field education, meta-analysis studies comprehensively reviewing the related literature, model suggestions and other similar original writings. Also, special priority is given to up-to-date studies using advanced research/statistical methods and techniques. Besides the methodological efficacy of studies, original and new contributions to the field are also among the basic criteria for the publication of a study. Articles sent to the journal are evaluated in a double-blind system. Journal accepts articles in Turkish and English. Articles whose full papers are in Turkish must have abstracts both in Turkish and English. Articles whose full papers are in English must not have abstract in Turkish. Articles sent for publication in the journal are first evaluated by the editor, and if approved, they are sent to two referees, who are university faculty members expert in the related field. The referees are asked to evaluate the articles in 30 to 45 days. In line with the views of the referees, the editorial board decides whether to publish or reject the article. Then, the author is contacted and informed about the process. 1. The text should start with “Introduction”, which includes the purpose, scope, the related approaches in literature and the method applied in the study. At the end of the text, there should be “Discussion and Conclusion” part in which the findings obtained are presented and “Suggestions” if there are any. 2. All the paragraphs in the main text should start with an indentation of 1,25 cm. Including the notes and references, the font-size should be 11, and the font-character be Palatino with a line-space of 1,5. The text should be placed on the page with a space of 3cm on the left, 2 cm on the right, 4 cm from the top and 3 cm from the bottom without giving any page number. 3. The Turkish title of the article should be written in bold-type using the font-size of 14; the font-character of Palatino; 15 words at most and all with capital letters; aligned in the middle; and followed by an English title written in bold-type using the font-size of 12; the font-character of Palatino; aligned in the middle; and all the words only with the initial letters being capital. Just below the English title, the names of the authors should be written in bold-type using the font-size of 12 and the font-character of Palatino aligned in the middle. Note with a number (1) should show the writer’s corporate address and note with a star (*) should show corresponding authors e-mail address. Titles and status shouldn’t be mentioned. The Turkish and English abstracts should be placed under the names of the authors. The abstracts should be written using the font-size of 10 and the font-character of Palatino, aligned on both sides. One-line space should be left under the abstract, and at least 3 and at most five keywords should be written. 4. The paper including the main article, notes, tables, figures, pictures, graphics, and charts should not be more than 25 pages. Figures, pictures, graphics and charts should be numbered in order, and the order should be mentioned; titles should be written over where it is necessary for the text. If they are cited, the reference should be given as footnotes. 5. The names of the tables and figures should be written in bold-type using the font-size of 10 and the font-character of Palatino, aligned on the left. The writings in the tables and figures should be in font-type of 10 with the font-character of Palatino. Horizontal lines should be used for the table demonstration. 6. The text to be sent should be typed using the word processor of Ms Word. 7. While giving references in the text, the APA 6.0 style, one of the common methods of citing references in social sciences, should be used. It is the authors’ responsibility whether the references are correct or not. The notes and references should be separated. If there are any notes, they should be numbered in the text and placed at the bottom of the page in order. 8. In studies sent to the journal, special attention should be paid to language use in terms of spelling, punctuation, grammatical accuracy, clarity, comprehensibility and so on. Therefore, the author is responsible for any problems and criticism likely to occur. 1. When the “tracking changes” feature of the MS Word in the tools of the menu bar is activated, copy editor can make the changes which are thought necessary. The texts s/he adds can be seen in a different colour while the texts s/he removes from the article are seen as strikethrough, coloured, or deleted in the page margin. Copy editor can write the sentences which s/he wants to ask the writer or editor between square brackets. The article edited by the copy editor is uploaded in the system to be sent to the editor. Editor reviews the article and asks for writer’s opinions. The editor can change the editing they think are proper in a normal form by conforming them, they can change or make new additions or extractions in a different colour if they desire. If there are questions between square brackets, the writer and editor should answer them in these brackets. After the editors’ and writers’ checking up, copy editor reviews the article as a last time and confirms the changes. Then, the article gets ready for the page order and typesetting. 2. Instructions to make electronic arrangements in the article draft by using Harward Educational Review. While making electronic arrangements in the draft article, follow these steps: Responding to the suggested changes İf you are confirming the suggested changes, change the text to the normal font from bold. If you do not confirm the suggested changes, write the original sentences again and make it bold. Adding or removing texts: Mark your additions by making them bold. Write the extractions between squared brackets as in the examples: [ extracted texts]. If you are removing one sentence or more than one, write a note in the related part: Example; [ 2 sentences removed: extracted text]. Answering the question directed to the Writer: Do not do treat any way or not delete the question directed to the writer, leave them bold in the text. Write your answer at the end of the question as in the example: [ writers note: method is broadened as you suggested]. Making comment: use the comment part to explain the arrangement of the article or high amount of changes: Example; [comment: the paragraph above moved here from page 5]. Note: while numbering the pages, use page numbers which are in the printed copy sent you. Page numbers can change in the process of electronic operations. First copy editor document: The copy editor of the journal add a question to be directed to the writer in the necessary points after reviewing the text for fluency, clarity, grammar, word choice, and form. Then, uploads the article to the journal web page and sends a note to the writer asking him to check the article. · Writer arrangement copy: before making significant changes about the form and layout of the article whose first arrangement completed, the writer should get the editor’s thoughts. S/he should answer all the questions directed to him/her by confirming or refusing the suggested changes. After completing this process, writers should change the document name to the WriternameQAR.doc from WriternameQA.doc (example: LeeQA.doc instead of LeeQA.doc) and upload the document to the journal website. · Last copy arrangement: Copy editor of the journal will confirm the writer’s changes and prepare the last copy by unifying the answers and the text. S/he will alert the page layout editor to complete the forming process after uploading the last copy to the journal webpage.